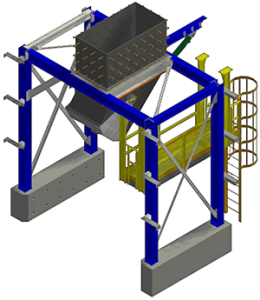 The chute is extremely ruggedly built, with wear points reinforced with minimum 400 BHN hardened steel liners. Liners are optionally available in 500 BHN hardened steel for maximum durability. Our Arc Gates Chutes are engineered for safety. They come equipped with a complete safety brattice system to protect workers from flying debris. Both the hydraulic and pneumatic models are failsafe. The Variant Arc Gate Chute is designed for easy maintenance. All units are equipped with central lubrication systems. Improved Safety Our Arc Gates Chutes are engineered for safety. 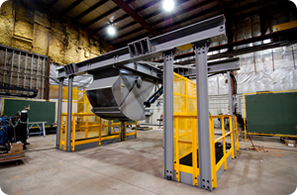 They come equipped with a complete safety brattice system to protect workers from flying debris. Both the hydraulic and pneumatic models are failsafe.